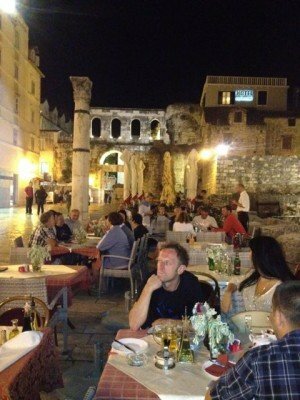 I love going on vacation out of season when the weather is still perfect and the town and hotels are only half-full of more discerning tourists; the bumper families who descend in July and August having returned to their routines of work and school. We’re staying in a beautiful quiet spot on the island of Hvar that has dreamy views and a very still warm Adriatic sea gently kissing the shores. Sun-loungers covered in bright orange mattresses deck the rocky tiers beside our private beach, dotted with spruces, pines and other exotic trees, providing shade and privacy. Nirvana. The joy of floating and snorkeling in clear blue sea and then drying in milky warm sun takes over as we let our bodies relax. So, too, do our minds empty. Stress-inducing, incessant work email is left on the plane. But our love and attachment to technology persists. Free Wi-Fi is pervasive, in our hotel, in the town, the bars, the restaurants and even at the beach on the sun loungers. We scan our friendly email, look at our twitter feeds and read the news – but only for the news and trends we want to catch up on. On the first afternoon of our arrival I snapped with my iPhone one of our fellow guests slumbering, having quickly given up on her Kindle and succumbing to a change in her body rhythm. It lay inert in its place. At breakfast it popped up again. Everyone nowadays (even the retirees) has a Kindle, iPhone or iPad perched besides them at their table. They seem part of the furniture. In the evening whilst having a sun-downer, A and I tried our voices at Siri, on our respective iPhones. We have previously both only ever had a fun time with him, showing him off to others who have not experienced asking him questions. Treat him like a fun app and you don’t get disappointed. He becomes the topic of conversation – since he always ends up misunderstanding you or only ever being able to tell you the weather. And you nearly always end up swearing at your phone because you want to see if he understands that – we’re all childish at heart. We asked him last night – admittedly after a glass or two of wine – what ‘good morning’ was in Croatian. On cue, he replied that the weather in Zagreb was 18 degrees. We tried a few more times, speaking ever more slowly and loudly into our phones, as one does to a foreigner or a child who does not understand you. Each time, we ended up in fits of laughter, listening to ourselves asking a piece of technology to tell us what good morning was in another language. Imagine if we were trying this on the train to London in the morning, our fellow commuters would have throttled us before even nearing Hayward’s Heath. When the waiter came by to ask if we wanted another drink we asked him what good morning was and he told us sweetly what to say. 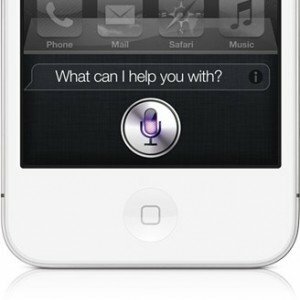 Sorry Siri – the human won effortlessly – but not nearly as much fun. 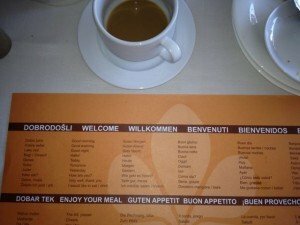 Next morning at breakfast, we noticed paper sheets on our dining table overlaying the tablet cloth – listing all the key phrases a tourist needs to know in 5 languages. The irony made us chuckle heartily over our continental breakfasts. While we were playing with Siri at the bar the night before, we kept switching over to the BBC Sports page, in order to keep updated on Andy Murray’s semi final against Tomas Berdych in the US Open Tennis championship. Every few minutes a new line of text would pop up, nudging the old score down. There is something very exciting about waiting in anticipation for it to appear and imagining the game play out in the way you want, instead of watching or listening to it unfold under its own volition. When you imagine right there is a tremendous sense of satisfaction. A whole different way of experiencing sport. We’d caught a glimpse of the start of the match on the receptionist’s TV as we left for dinner, then again as we passed a bar in town. We saw that Andy had lost the first set and, so later, when we got back and read on our iPhones that the match was into its 4th set, we assumed that it was Tomas who was 2-1 up in a commanding position. The set ended with a tie-break and we saw ‘match point’ flash up followed a couple of minutes later by ‘match point saved’. It got very tense for us, not knowing when the next update would come or whether Andy had already been knocked out. Being Andy, we assumed the worst and were about to switch back to Silly Siri when a new line of text appeared ‘Murray through to final!’ Our excitement was palpable. And the joy at regaling how we had got our wires crossed about Murray was even more fun. To ‘disconnect to reconnect’ is an oxymoron to our ears. It is an integral, extended part of us now not an addiction. The trick is to switch your technology into holiday mode and use it to enhance and join in the fun. That is where Siri and Kindles can give so much pleasure. It is simple once one understands how to switch. I am sitting on a terrace by myself, listening to the sea on one side and plates being cleared away in the distant dining room, using my laptop to write this – I have never enjoyed writing a blog entry so much. It is natural, tranquil, and bliss. And technology is ever present in its place. It would not be nearly as much fun without it.